Barcelona Manager Ernesto Valverde hailed his Skipper Lionel Messi after he single-handedly won the game against Real Betis. Barcelona faced Real Betis at the Benito Villamarin on Sunday in an entertaining encounter. Valverde named a strong side for a tough away game, opting for Vidal, Arthur, Busquets, and Rakitic in the middle and sacrificing on his attacking options. However, he still had Messi in his team, and the Maestro was enough to see off a spirited Betis side. In the 18th minute, Barcelona won a free kick at the edge of the area and their Skipper stepped up to take it. The finish was as exquisite as ever, as the ball gracefully curled into the top left corner, with Lopez in Betis goal beaten. Yet, the Argentinean was just warming up. Just at the stroke of half time, Suarez drew in the defenders and then passed the ball to Messi to score. The Argentinean still had a lot to do, especially with three defenders breathing down his neck and Lopez closing him down. And just as expected, Messi managed to score. Barcelona were 2-0 up and cruising. In the second half, Suarez made it 3-0 before Betis got one back themselves. But the highlight of the game was still due. In the 85th minute, Messi took the ball back from Rakitic just as he entered the box and hit it with unreal precision. The ball floated over the entire Betis defense, over the flying Lopez, hit the base of the crossbar and rested into the net. Barcelona were 4-1 up and Messi had completed his hattrick. 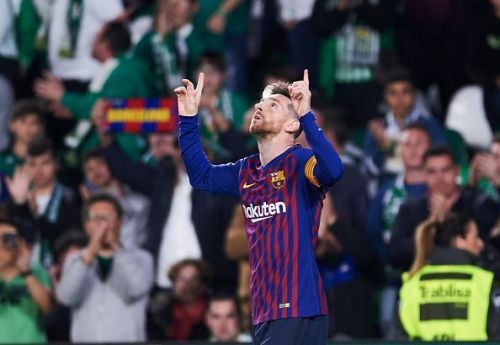 Messi’s astonishing performance and the beauty of his third goal seemed to have won over the Betis supporters, who gave him a standing ovation. Some fans even chanted his name and after the match, Barcelona Manager Valverde was quick to point out that even though opponents lose because of Messi, everyone appreciates his talent. He was fantastic tonight, he scored three goals and also helped Barcelona score a fourth. The public recognise his talent, they enjoy seeing him in his best and they respect him because of the player that he is. Barcelona next face Espanyol at home at the end of this month, after the International break.